Bim Bam Boomer: What is True American Greatness? What is True American Greatness? We all know them: the neighbor guy who spends all his time working so he can amass more "toys" and is so preoccupied with himself that he doesn't even know your name. And then there are the relatives who can't let you forget about their fabulous vacations and luxurious lifestyle, but who never give a cent to a charity organization. These people have the best of everything. They lack for nothing materially, but would you consider them "great?" Of course not. They may have fashioned successful lives for themselves, and there is nothing wrong with being materially successful in and of itself, but they do absolutely nothing to enhance the lives of others. No one would describe them as "great". True greatness is hard to define, but when we think of a great individual we think of someone who has done extraordinary things for the good of others. 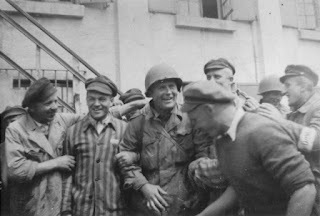 America's "Greatest Generation" is defined by journalist Tom Brokaw as those men and women, many of whom are still with us, who put aside their own plans for themselves and gave large parts of their lives to fight tyranny in World War II. They were common, ordinary Americans but when called upon to make sacrifices to ensure freedom and democracy were safeguarded at home and abroad, they did so willingly and unselfishly. The dictionary has various definitions for the word "great" but the one that applies particularly well is "notable, remarkable, exceptionally outstanding." When America was at its greatest was when we were standing up to defend freedom and the rights of those who could not defend themselves, or when we showed great courage in the face of adversity. Think "Civil War and the abolition of slavery." Think of Ronald Reagan saying, "Mr. Gorbachev, tear down this wall." Think of Jesse Owens at the 1936 Berlin Olympics. Think of U.S. soldiers liberating the prisoners at Dachau. Those are examples of true greatness in Americans. A country could have a zero crime rate, the most highly educated citizens, the best health care, the most wealth, and the lowest unemployment rate and not have any traits of greatness. If we are only concerned about ourselves and the quality of our own lives, we are not being "great", we are only being self centered. True greatness means wanting the best not just for yourself, but for all people, not just materially but spiritually. It means wanting others to enjoy life, liberty, and the pursuit of happiness, regardless of their definition of who "God" is, what they think "marriage " looks like, and where they came from. True greatness puts aside self interest and works for the good of others. I'm not sure when some people think America stopped being great, but if we want to be great "again" we need to look beyond ourselves, stay engaged with the rest of humanity, and resist the temptation to be concerned only with our own happiness.. Isolationism will not make us great, it will only make us self absorbed and irrelevant to the rest of the world.